When I first became interested in inquiry as an approach to teaching and learning (here’s a clue – my hair was permed and my jackets had shoulder pads), the emphasis was almost exclusively on planning/programming. We spent hours diligently planning “units of work” – carefully mapping out ‘hands- on activities’ children would do week to week to learn about the topics we chose for them. Not only was the focus more on the planning than the teaching…. the planning actually wasn’t all that good. The more I taught this way, the more I engaged in research during my years at the University of Melbourne and the more I observed teachers and children in classrooms - the more curious I became about the what teachers actually did and said(and didn't do and say) with the plans they had made. I was particularly fascinated by the magic that occurred when teachers successfully empowered children as confident, effective inquirers. The pedagogy of inquiry remains endlessly intriguing to me. I love the planning/design work we do but I know all too well that no planning is worth the effort if we don’t accompany it with a strong repertoire of practice and a real understanding of WHY we work this way. Knowing the ‘what’ matters - but it is in the why and how that the beauty lies. Having worked intensively with the practices in many classrooms (I am so lucky I get to teach kids all over the world) I knew there was some ‘tweaking’ to do. My workshops began to focus more heavily on these ‘ways of being’ as teachers. Hundreds of teachers have helped me further refine my own thinking about what it means to truly bring an inquiry stance to the classroom – regardless of the subject matter or the age group with which we are working. Suffice to say, these practices have been percolating for a long time! I find myself most often referring to this as teaching as an ‘art’. This is by no means the first time our work has been described as such but it resonates so strongly with what I see and hear teachers doing as they nurture agency through inquiry. My personal life is strongly connected to the creative arts - particularly music and dance. I have watched both my children thrive as learners in the context of the arts. For me - there is something essentially human about the way ideas can be expressed through art. Teaching, like dance, music, visual art is an act of creativity. There is skill, choreography and improvisation. What we do is almost magical when it is at its finest. There is such beauty in this way of being with children. It is intentional yet spontaneous, highly creative, it evolves and redefines itself over time. The skilled inquiry teacher works with a palette of possibilities and mindfully draws on this repertoire in response to their learners. There is indeed an art to inquiry teaching: choreography, composition and improvisation. So. With the help of a local artist, Justine Hutchinson, I set about trying to bring these practices to life as a series of art works. This time, I have chosen a different way of sharing ideas – not as a book, but with a set of cards that can act as a provocation, prompt inspiration, reminder or support to the interested teacher. And they are FINALLY ready and available on the website. The images have been designed to symbolise the essence of each practice. On the back of each card is a summary of techniques, a reminder of strategies and some ideas for applying the practice to the classroom. I am so excited they are finally here. 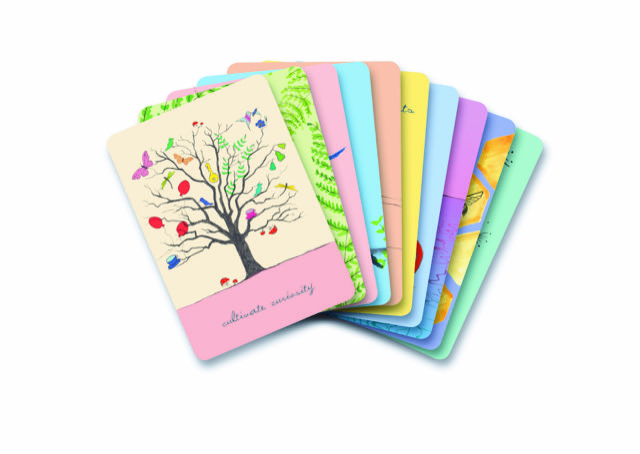 If you do purchase a set of the ‘Art of Inquiry’ cards – I would love to hear how you use them and how they work for you. There are some suggestions in the pack itself but it would be so interesting to hear about how they contribute to your growth as an inquiry teacher. I currently have them sitting on my desk at home – in little perspex stands. The remind me of what it means to teach (and learn) this way and of the beauty in the art of inquiry. What practices are on your palette?